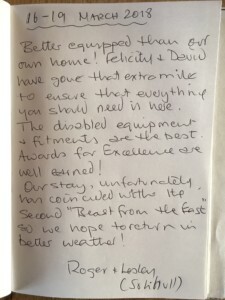 We love our luxury log cabins and are delighted the VisitEngland assessor loved them too! At our recent inspection we retained our 4 Star Gold Awards rating through the VisitEngland Quality Assessment Scheme. Star ratings are not only awarded on the quality of our facilities, but also on the services provided and our hospitality. The inspection covers all aspects of the business and visitor journey, from initial enquiry and the website through to guest stay and departure. To gain the extra Gold Award in addition to the 4 Star rating shows that our standards and customer service are extremely high. Like the Hotel Inspector Alex Polizzi on the television the VisitEngland assessor is extremely thorough, checking everything from cleanliness, to pots and pans and ensuring mattresses are springy and comfortable. No stone is left unturned – tops of wardrobes, under beds, backs of cupboards, all the nooks and crannies are checked! Thanks to our amazing team of hardworking housekeepers I am delighted to say that the inspector reported “The underlying levels of cleanliness were found to be very high” and “sanitary ware is sparkling”! She also praised the wide selection of accessories and lovely personal touches. The Inspector also assessed our disabled facilities and we are proud to have retained our National Accessibility Scheme ratings for Mobility, Visual and Hearing. The inspector was impressed with the excellent provision of mobility aids including an off road wheelchair. 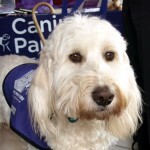 You can read more about this in our next blog, or view our disabled holiday accommodation. In addition to the star rating we also have extra facilities and provisions to Welcome Families, such as highchairs and travel cots, toys and games. 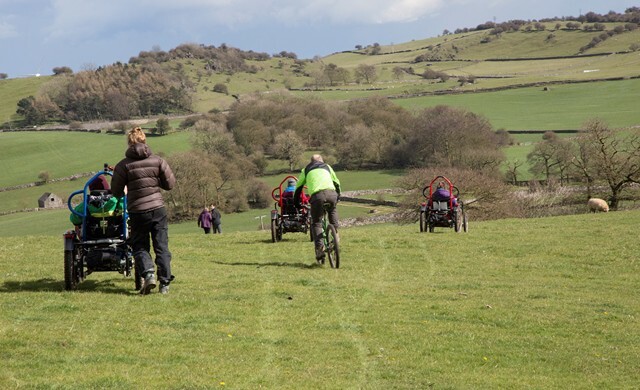 Hoe Grange is an ideal base for exploring the Peak District countryside so to Welcome Cyclists and Walkers we have route maps, washing facilities, puncture repair kits and secure cycle storage for guests to leave their bikes. We value the inspection process as an excellent way for us to ensure we have everything in tip top condition ready for your arrival. We continually strive to improve our log cabins and gorgeous glamping pods so you can relax and enjoy your holiday to the full. 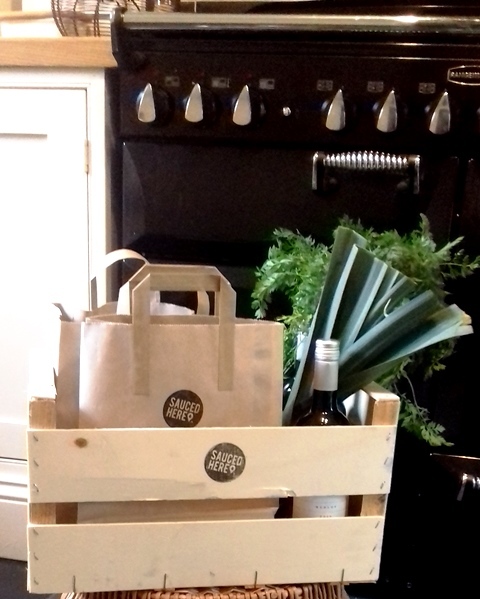 It’s all the little things that make the difference, such as new Denby pottery mugs, our #LoveLocal welcome pack of Peak District goodies and up to date leaflets to inspire you to visit our amazing local attractions. Although the inspection is once a year we have a continual improvement plan in place to renew and improve our facilities on an ongoing basis . For example in January we refreshed Hipley master bedroom, which now has a sumptuous superking bed. With the new mattresses guests have the flexibility for the bed to be split into 2 singles if staying as a group of friends rather than a couple. To add a contemporary touch I also bought a beautiful new print of Wirksworth skyline for the wall from a local artist. 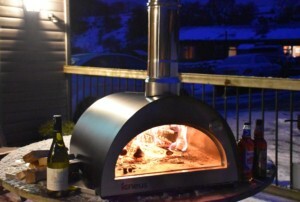 There is nothing better than food with friends so why not treat yourself to a fun evening and hire the outdoor pizza oven. To make things easy we provide the oven and logs, together with the pizza dough and passata. All you have to do is provide the cheese, your favourite toppings and then get cooking. Our new #LoveLocal shop and laundry room is also nearly complete – watch this space for further news! I believe that our guests appreciate the effort we go to to maintain our high standards. However don’t just take our word for it; we have some wonderful comments in the guest book or read what our guests say about us on TripAdvisor. Every picture tells a story, so why not take a peek inside our gorgeous log cabins with our new 3D virtual tours! We look forward to welcoming guests both old and new in 2018! It’s time for a 3D virtual tour! Exciting news! Join us – you can now step right in and take a magical 3D virtual tour of all our log cabins and glamping pods holidays. 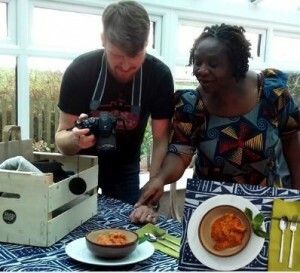 Wow – this new virtual reality technology is simply amazing and Leighton of 3D-Pi has made a fantastic job of capturing our self-catering holiday accommodation. Standing admiring the view you can almost feel the wind in your hair! We can guarantee that once you taken the tour you’ll want to book a holiday with us in the stunning Derbyshire Peak District countryside. These 3D virtual tours even show a dollshouse view so you can see the layout and floor plan of the each cabin, before zooming into each room for a closer look. It’s so easy to explore all the spaces and even take in the view from the decking. The process uses cutting edge 3D infra-red camera technology to scan each room in 360 degrees. Leighton worked progressively through each log cabin strategically placing the camera in the right spots to enable the images to be stitched together, a bit like piecing a jigsaw together. Once each cabin was completely scanned, all of the images were uploaded to Matterport and pulled together to enable the 3D model to be created. It’s a little mind boggling and you might even say magical, but I am sure you’ll agree the result is a seamless, immersive and fun experience. It’s such fun that I have to keep going back and looking round the cabins. The 3D tours show so much more than a flat photograph and are even more intuitive on a mobile phone. You can clearly see for yourself exactly what our facilities are like before you book – go on take a peek! and if you’re a real techy, and have VR googles for your phone, it’s mind blowing! We hope these new interactive 3D tours will be of great benefit for guests with disabilities, who will be able to see how spacious our accessible log cabins are.There is also a 360 view of the wet rooms, showing the various shower chairs we can provide. It is often said that a picture paints a thousand words and hopefully this will give guests confidence to select the right cabin for their accessible holiday, and will answer many of the frequently asked questions that you need to know before arrival. Taking a step inside has particularly worked well in the glamping pods, where it can be difficult to get a good photo as the space is relatively small. We have shown the day time layout with the sofa in Swallow and the night time layout with the bed pulled out in Skylark, to give you an idea of how the space works when you stay. 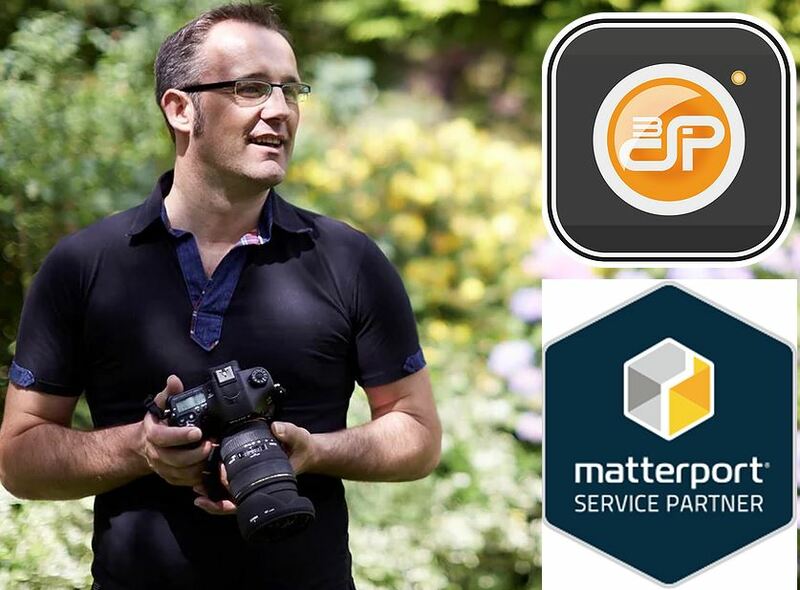 As you take your 3D virtual tour you will notice all the little extras that we provide so you don’t need to overload the car with unnecessary extra equipment. In Swallow glamping pod you can also see that you can bring your dog on holiday to enjoy the many wonderful walkies through the Peak District countryside and up onto the High Peak Trail. The tours are linked so you can jump from one virtual tour to another by clicking on the coloured pins and choosing where to go next. You can journey through all the log cabins and glamping pods before deciding which view you like best and which to book! It is such a realistic interactive 3D experience that you can easily imagine yourself on holiday here at Hoe Grange, relaxing on the decking, sipping your glass of wine and watching the world go by. As the chimes of Big Ben welcome in the New Year we take stock, and look forward to the year ahead. 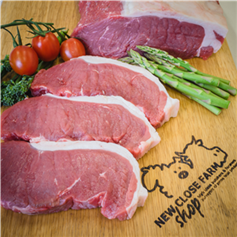 We start planning our summer holidays and promise to loose all the weight we have piled on over the Christmas period by going on a detox diet. Your trousers seem to have shrunk in the wash – surely it couldn’t be down to all those extra chocolates, crips, alcohol and excess food that you ate over the Christmas holidays? Fear not, it doesn’t need to be that difficult! 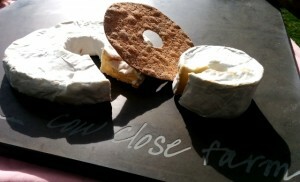 You’ve had a healthy breakfast and lunch, but now you’re craving something sweet to help get you through the afternoon. Chocolate, biscuits and cake are a fast easy option, but if you want a healthier sweet fix, why not try your hand a making energy balls? Made from a combination of nuts, dried fruit, cacao, nut butter or shredded coconut, energy balls are high in protein and packed with vitamins, antioxidants, proteins and all sorts of bits and bobs that help keep your body fighting fit. They are an ideal healthy mini snack to satisfy those sugar cravings and tide you over until dinnertime. Help is at hand from Victoria who has lots of delicious energy ball recipes for you to try out – no cooking required! 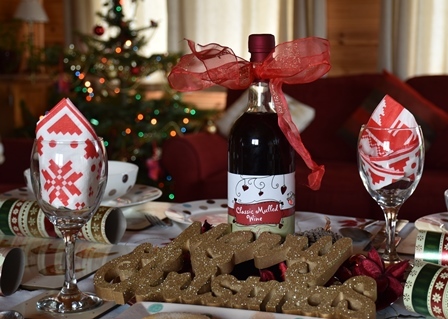 As a New Year giveaway you can win all the ingredients to make January’s mean green energy ball recipe, including maple syrup, organic spirulina powder, hazelnut butter and walnuts, worth £15.94. 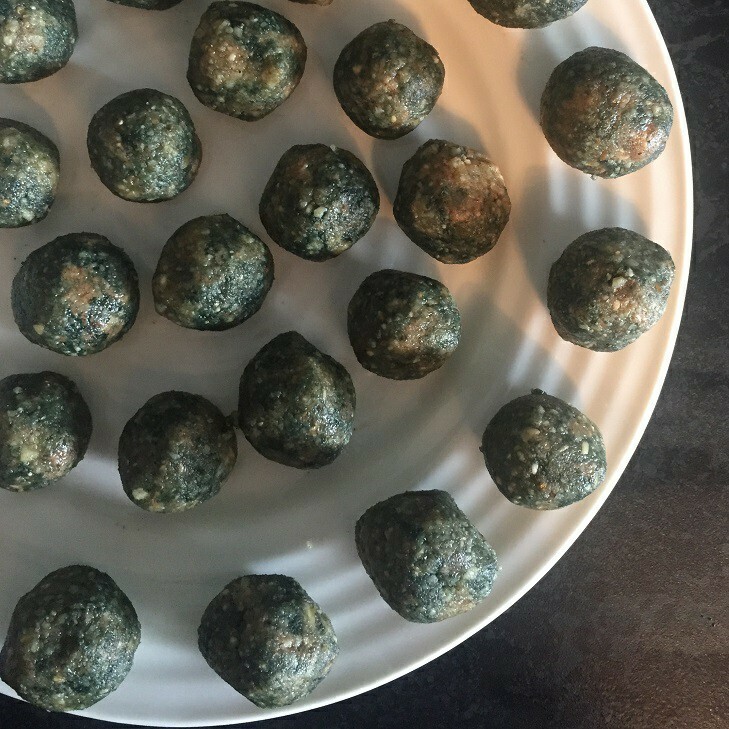 Spirulina is a superfood, grown in ponds in China, which doesn’t sound great, and perhaps these energy balls look a little like overcooked brussel sprouts, but trust me they taste amazing and are really high in nutrients. Maybe dieting isn’t your thing. Instead use natural healthy ingredients in a different way and give yourself a simple homemade avocado and oat face mask to get your skin glowing again. If that sounds too much like hard work perhaps you would prefer to take time out to re-energise, rejuvenate and repair with a relaxing full body massage, pedicure or facial. My Personal Sanctuary therapists can visit you whilst on holiday so you don’t have to leave the comfort of your cosy log cabin! Close your eyes for a moment and imagine you are relaxing in one of our cosy cabins or glamping eco pods, wrapped in a warm fluffy towel, lying on a heated treatment bed, soft soothing music playing in the background, and heavenly scents filling the air. What better way to make the most of your relaxing self-catering holiday in the Peak District hills, than to pamper yourself? Take advantage of the Early Bird SPA Treatment Package and book your treatments before 28th February to get a £30 discount. (offer valid for treatments taken between 1st Jan and 31st Dec 2018). Or enter the MPS competition to win a 1 hour Spa Treatment Package. I can’t think of a better way of spending quality time with your family or friends. At a glitz and glamour gala evening hosted by Jules Hudson of BBC Countryfile fame, the Rural Business Awards overall Champion of Champions was revealed at Denbies Winery in Surrey on Thursday 5th October. We thought the competition in the category of Best Rural Tourism Business, of which we were one of 5 finalists, was stiff to say the least. With a diverse group including, an open farm/craft venue employing 50 people, a welsh Eco wedding center, a glamping site in Yorkshire and a stunning holiday cottage in Lancashire, we were resigned to be leaving without a prize. However when the runner up in our category was Barleylands Farm and craft village there was a glimmer of hope for the top slot. 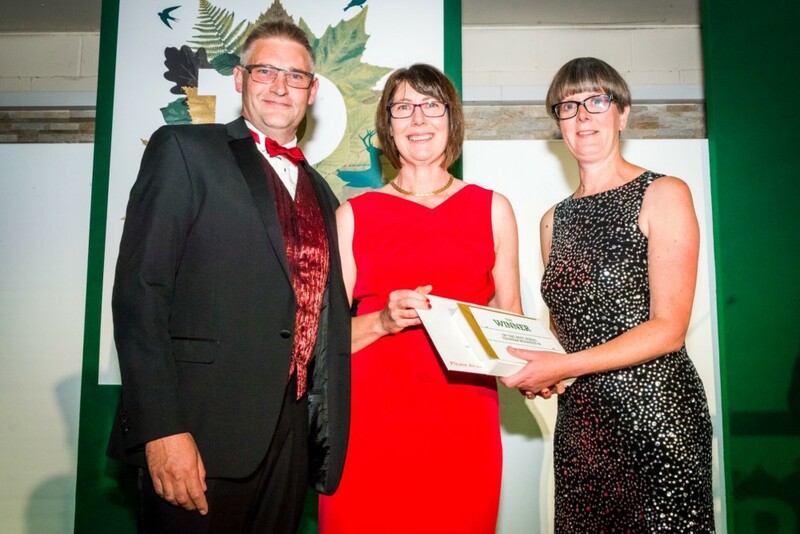 As Jane Headley, Senior Tutor at Harper Adams University, opened the gold envelope Felicity and I were overwhelmed to hear Hoe Grange Holidays from The Derbyshire Peak District announced as the winner! 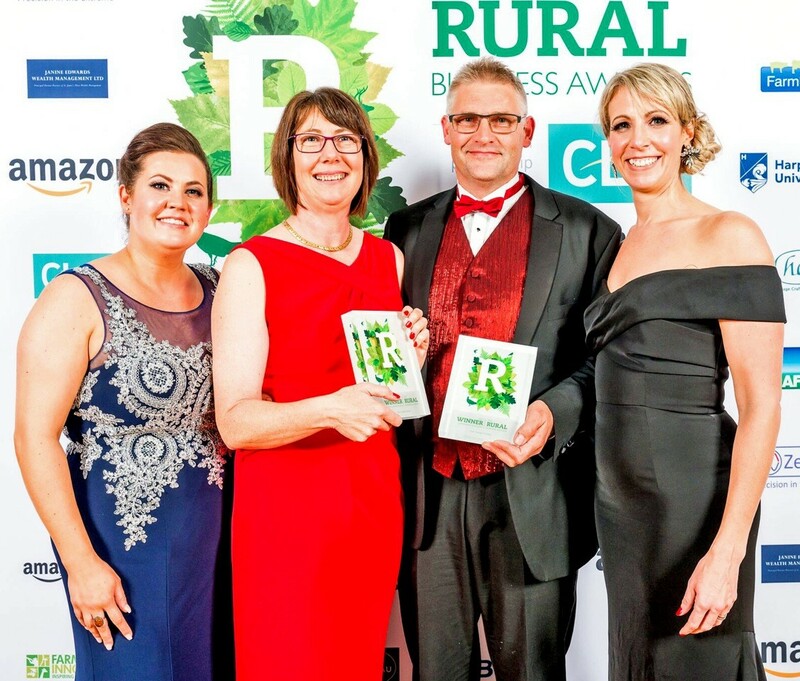 After being presented with the Best Rural Tourism Award on stage before the 300+ audience we were whisked off for photos and interviews. It was then time to relax and revel in the glory of such a prestigious award. Having removed my jacket and loosened my tie I enjoyed a celebratory glass of the excellent Denbies red wine. 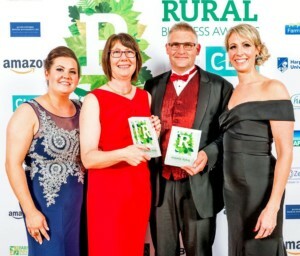 At the very end of the evening the co-founders of the Rural Business Awards, Jemma Clifford and Anna Price, announced the outstanding category of Champion of Champions. The winner was the finalist with the highest overall scores in the highly secretive and technical judging system. Judges marked entries individually so no one knew what the other judges thought or indeed who had won! The atmosphere was electric. The judges were unanimous in their decision and you cannot imagine our surprise when the clear winner was announced as Hoe Grange Holidays! Wow! Stunned and amazed, after a rapid re-dress and quickly retying my tie we made our way to the stage to rapturous applause to receive our second trophy of the evening. It was all was a bit of a blur and our heads were in a spin, so imagine the shock and horror when they asked us to address the gathering! Thinking on my feet I thanked my wife Felicity for all the hard work over the last 12 years and said that to be recognized in such a way by a host of industry experts was the ultimate reward. I think I may have earned some extra brownie points there! 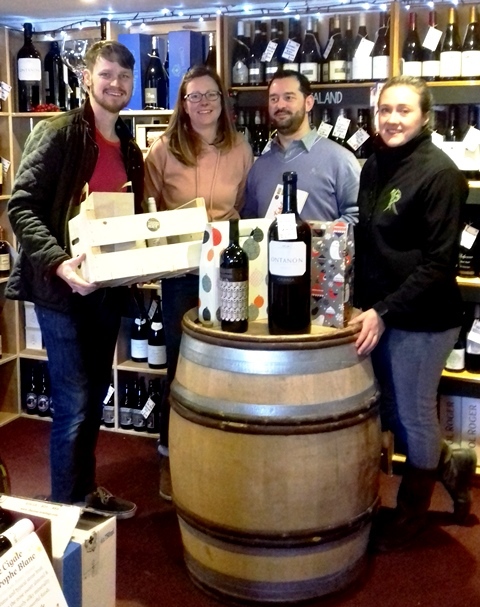 Felicity added her thanks and said how the teamwork between the two of us was well balanced; with her creative ideas and me keeping a close eye on the purse strings ensuring that as well as having a fantastically inspired business, it remained financially viable! As well as a scrumptious meal with superb English wines from Denbies, guests were entertained by Faith Tucker, a very talented 17-year-old opera singer. 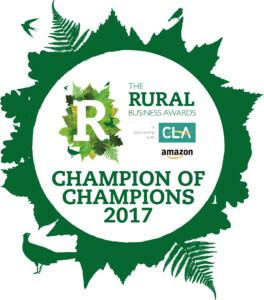 The evening was sponsored by the Country Landowners Association (CLA) and Amazon and celebrated businesses from all corners of the UK. 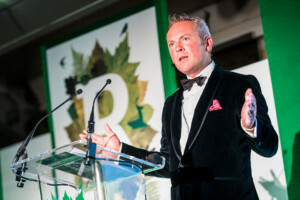 The finalists in the 13 categories were as diverse as technical fabric producers, butchers, PR companies, software developers, sporting businesses and of course holiday providers. 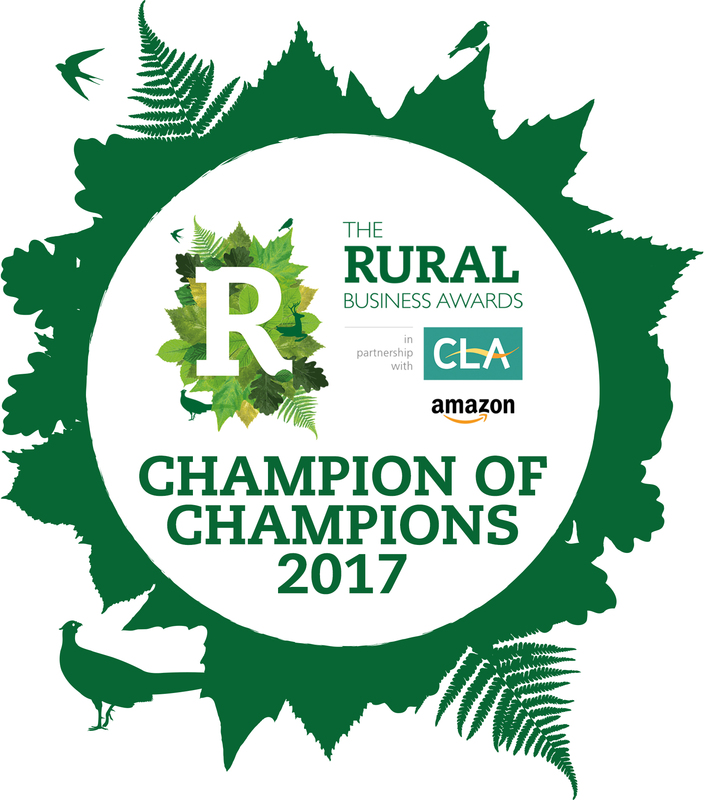 Find out about the other amazing finalists and winners of the Rural Business Awards 2017 here. Since the Rural Business Awards ceremony life has been quite hectic, appearing on East Midlands Today TV, and Radio Derby breakfast show, to talk about our eco-friendly, accessible self-catering holidays, as well as featuring on many social media platforms and blogs. 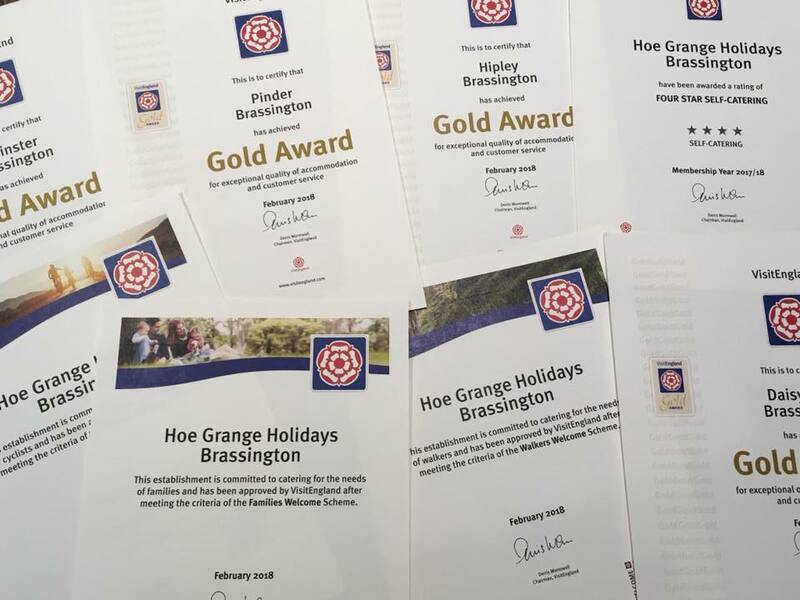 Awards co-founder Anna Price said: “We had more entries in our tourism category than any other but Hoe Grange Holidays just blew us away and was a clear winner, not only in this category but of the whole awards. 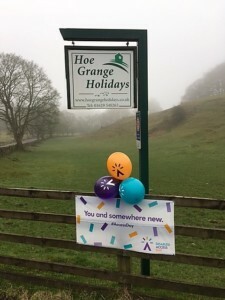 The shortage of holiday providers offering good quality disabled access is shocking and we loved how Hoe Grange was showing such imagination in filling this gap in the market. Huge congratulations to them, and we wish them every success in the future”. 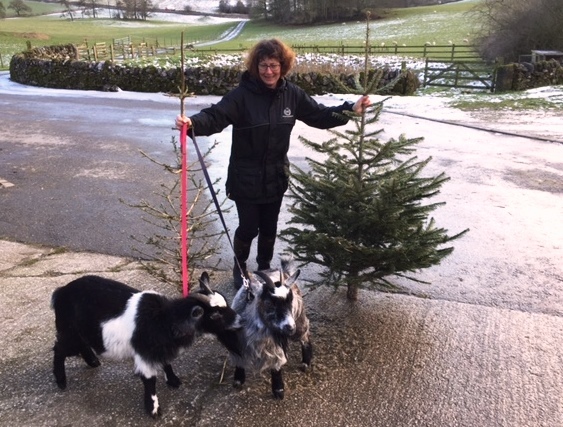 Although back down to earth at home in the Peak District countryside, cleaning log cabins, greeting guests and farming, we are still on cloud nine and celebrating our tremendous achievement! Felicity and I are delighted to announce that we have received a TripAdvisor® Certificate of Excellence for the 7th time in the seven years since its introduction. A real achievement thanks to our dedicated housekeeping team and all you lovely guests. We really appreciate the time you take to leave such wonderful online reviews about our cosy log cabins and gorgeous glamping pods in the Peak District . The Certificate of Excellence accounts for the quality, quantity and recency of reviews submitted by travellers on TripAdvisor over a 12-month period. To qualify, a business must maintain an overall TripAdvisor bubble rating of at least four out of five, and have a minimum number of reviews. 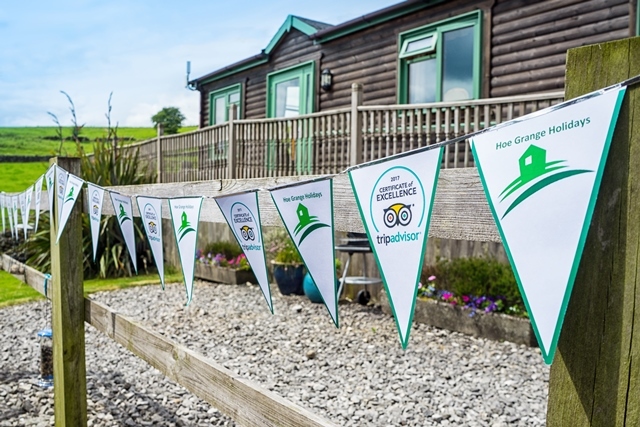 TripAdvisor is such a fabulous resource for anyone booking a staycation or self-catering holiday as the reviews show what you, our guests, actually think, and after all that’s what really counts! With our outstanding overall TripAdvisor bubble rating of 5, guests can book with confidence, knowing the level of service and quality of accommodation is second to none. In today’s technological online world reviews and scores are increasingly more important than the traditional star ratings, as reviews are based on experiences and hospitality, rather than the quality of the teaspoons!! Although the cabins do have very nice teaspoons, and a better equipped kitchen than our own house! To ensure we maintain high standards at Hoe Grange Holidays we are constantly reviewing and updating our facilities to keep up with modern demands and trends. 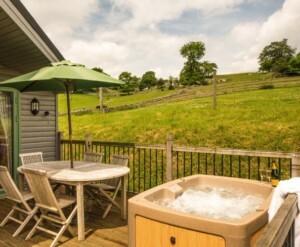 To this end we have recently added hot tubs on the decking of two of the four log cabins. 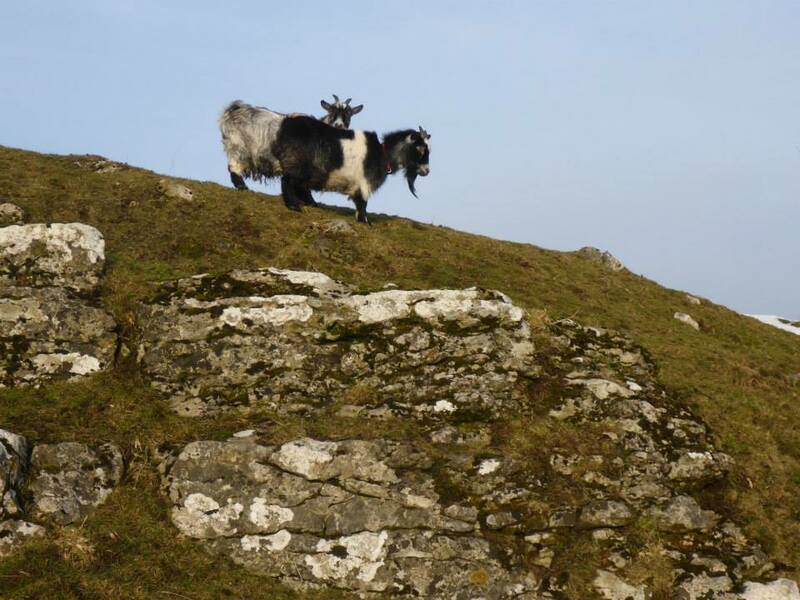 It’s not just about our fabulous location in the Derbyshire Peak District. Hot tub is now one of the most popular searches when people Google their next holiday accommodation. We have to agree hot tubs are a wonderfully relaxing experience, especially in such a peaceful place. You can truly relax in the soothing bubbling hot tubs on Daisybank or Pinder decking and watch the world go by – what better way to view the stunning Peak District scenery? 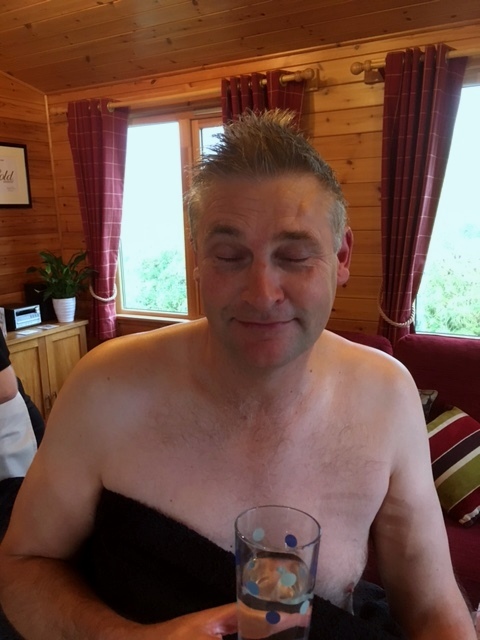 Our only problem is that the cabins with hot tubs are so popular we never get chance to use them ourselves! 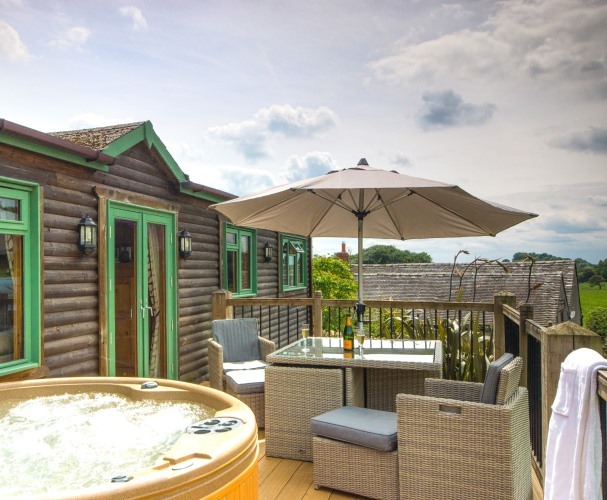 If you want to make the most of your staycation at Hoe Grange and book a holiday in a log cabin with a hot tub you’ll have to get in early – when they’re booked, they’re booked! 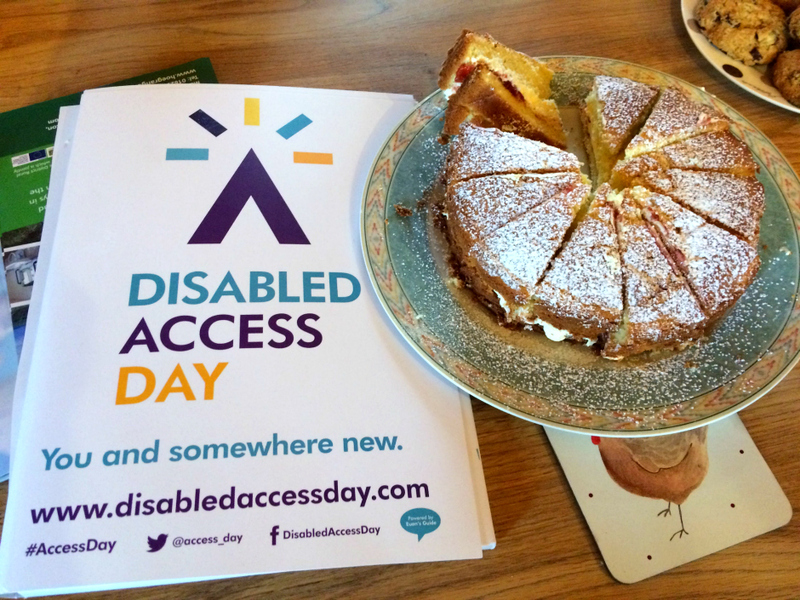 Disabled Access Day was initiated in 2015 by Paul Ralph as a day to celebrate good access and create opportunities for people to try something new in an atmosphere of cooperation, safety and fun. Paul wanted everyone to celebrate Disabled Access Day by highlighting the fantastic access that already existed, and encouraging people to experience new places. Now in its third year Disabled Access Day is about #YouAndSomewhereNew and continues to highlight the accessibility of places with touch tours, relaxed performances, sensory experiences, and level access. 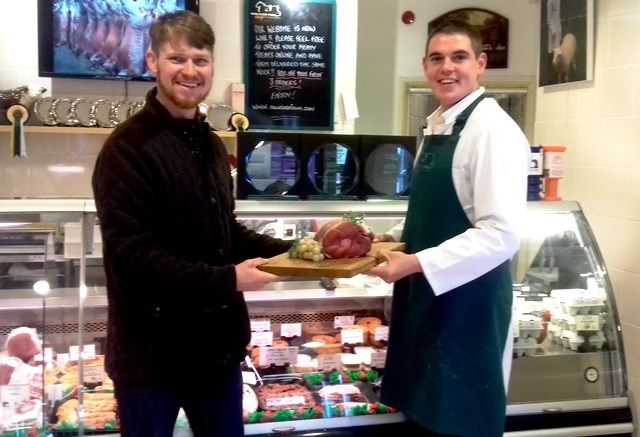 However it’s not all about facilities, one of the most important factors is a warm welcome! 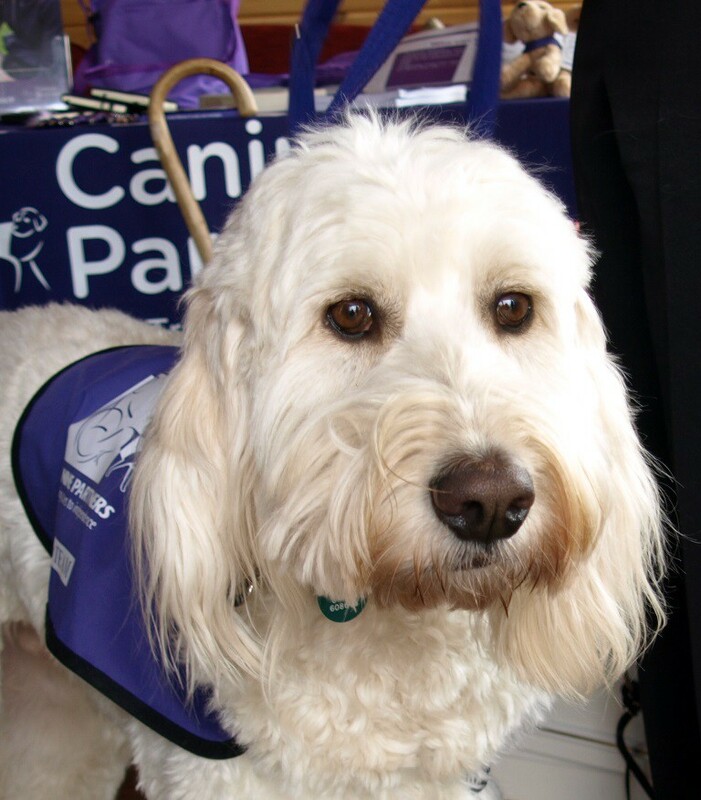 Last year we welcomed Canine Partners and the amazing assistance dog Rio who could help get people dressed, do the washing, fetch the phone and many more every day tasks to help his owner. This year at Hoe Grange Holidays we were delighted to give a warm welcome to Rob and Bridget, otherwise known as The Bimblers. The Bimblers write an insightful travel and holiday blog for wheelchair users and people with mobility problems. Rob and Bridget “bimble” around living life in the slow lane, and show how travel is possible, even with a disability. We love their style and the way they share their experiences making life easy for others; their valuable advice on how to enjoy travel enables everyone to make the most of their holidays. 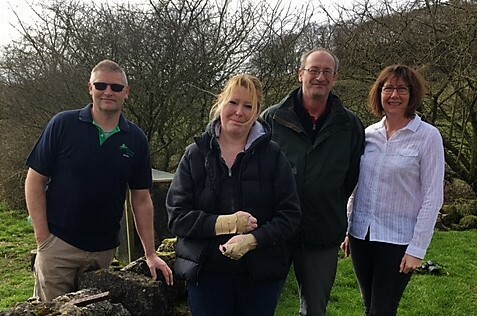 For the first time, Disabled Access Day was actually spread over 3 days, from 10th to 12th March, which meant there was more opportunity for everyone to join in. Disabled Access Day also aims to raise awareness of the importance of sharing disabled access information. 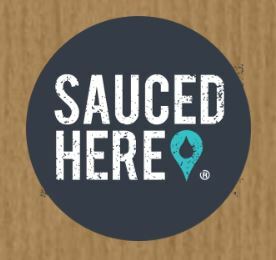 Not only were disabled people, their families and friends invited to visit new places and try new activities over the weekend, but they were encouraged to provide helpful feedback to participating venues about their accessibility by writing reviews on Euan’s Guide. If you haven’t already discovered Euan’s Guide, it’s the disabled access review website & app, launched in 2013 by Euan MacDonald, himself a powerchair user. The website provides disabled access information for venues including attractions, cinemas, sports grounds, places to stay, and everyday places such as the post office and local services. It allows users to share their experiences and review disabled access at places they visit, and is a fantastic resource if you are thinking of going somewhere new, but want to know what it’s like. If you have stayed with us and haven’t done so already why not write a review of our facilities on Euan’s Guide? The winter months with dark evenings and gloomy misty days can leave you feeling tired and in need of a little pampering – why not pamper yourself and book a relaxing beauty treatment or massage whilst on your holiday at Hoe Grange? As mentioned in our last blog such indulgence is a perfect #hygge way to perk you up and help you breeze through the dreary winter months. Close your eyes – now imagine you are relaxing in one of our cosy cabins or glamping pods, wrapped in a warm fluffy towel on a heated treatment bed, soft soothing music playing in the background, and heavenly scents filling the air. Under the skilled hands of an expert therapist, you’ve just experienced the most fabulous facial using natural, organic products, or perhaps a stress relieving back massage with hot stones, and all your aches and pains have melted away. With the professional and friendly My Personal Sanctuary therapists you are in safe hands and feel as though you are actually in a spa. However when your “spa day” in your cosy cabin is complete the therapists leave quietly allowing you to continue to soak up the calm and tranquil atmosphere. That to me is the real added bonus. Romance is in the air as Valentine ’s Day approaches. Why not experience some hygge relaxation as a couple? 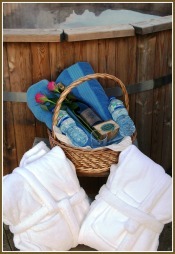 Two therapists can visit your holiday cabin at the same time to deliver treatments simultaneously. You can both choose the same treatments, or perhaps a hot stone massage for her and deep tissue massage for him? 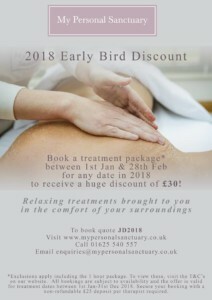 The price for two therapists delivering 1 hour treatments each is £240, for more information on MPS packages for couples click here. 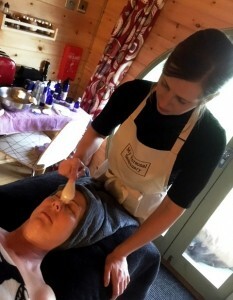 The friendly MPS therapists use only the very best techniques and Neal’s Yard organic products to nurture your body, mind and soul. 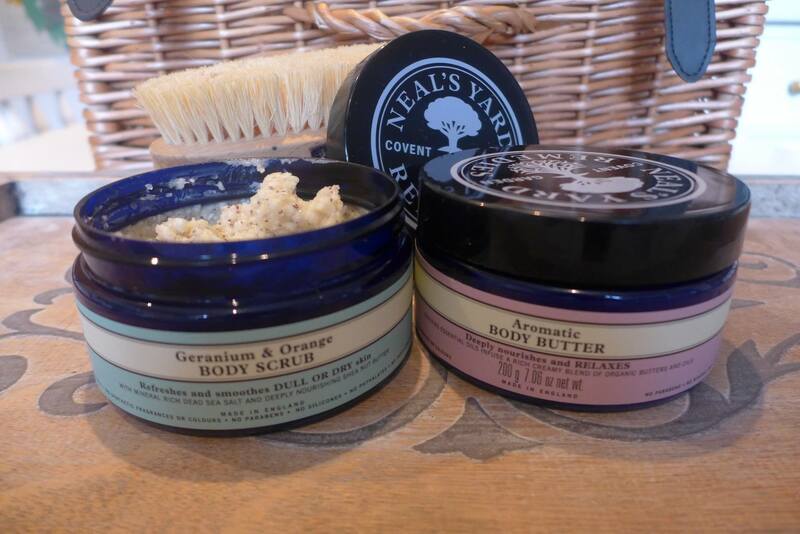 Such gorgeous natural remedies smell divine, and leave you soothed; they also fit in beautifully with our eco ethos. 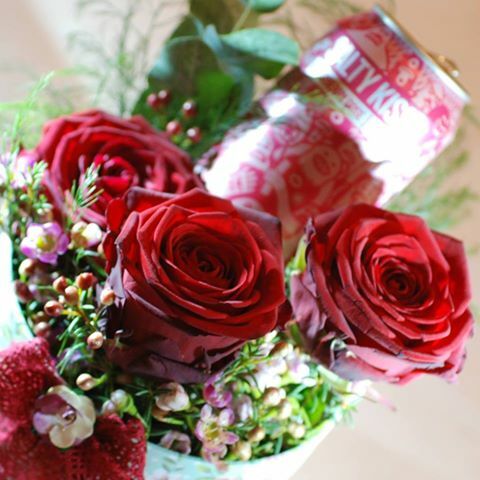 What woman doesn’t love a bunch of flowers? You can surprise your loved one with some gorgeous roses from #LoveLocal florist Sheila at Freedom Flowers in Wirksworth, or think ahead and order a bunch of sunshine for your mother for Mother’s Day. Heading into March Mother’s Day is a very important day! Many of us are Mums, and have Mums, or are even Mums to be! MPS can provide treatments from young to old including mums in pregnancy to give a special gift to celebrate Mother’s Day. Why not book a longer package and share the time and enjoyment between generations? Mum may like to take some time to relax with a relaxing Aroma Massage, and Grandma may prefer to restore and relax with a Calming Foot & leg treatment. You can even get the children involved to with the selection of MPS Mini/Kiddie treats! It’s a perfect way to share an afternoon or a morning with loved ones and create wonderful memories. A Mother’s Day package could include an Aroma Massage for Mum, a Calming Foot for Gran, a Kiddie treat and one mini treat, all delivered by one therapist over 2 hours for just £180. For more treatment ideas for family and friends click here. The after glow – you too could look like this! Go on and book a treatment for your stay with us – find that inner calm and serenity without leaving the comfort of your cosy cabin or glamping pod! David and I treated ourselves to a My Personal Sanctuary spa day (I know, the things we have to do for our guests!). With first hand experience I can definitely promise you will go home relaxed, refreshed and revived, but beware it may not be your best look! Looking back on 2016 one of the biggest trends has been the interest in “hygge”; so as the year draws to a close we thought you might like some inspiration on how to have a hygge holiday. The Danish word “hygge”, shortlisted by both the Oxford and Collins dictionaries for the word of the year, has no direct translation, but is often described as cosiness and a feeling of comfort; the enjoyment of everyday experiences. To pronounce this phonetically challenging word make a pouting face and say HUE-gah! Hoe Grange is the ideal place to stay in the winter as our log cabins and gorgeous glamping pods are warm and cosy, so you can relax and enjoy the good things in life with the people you care about around you. 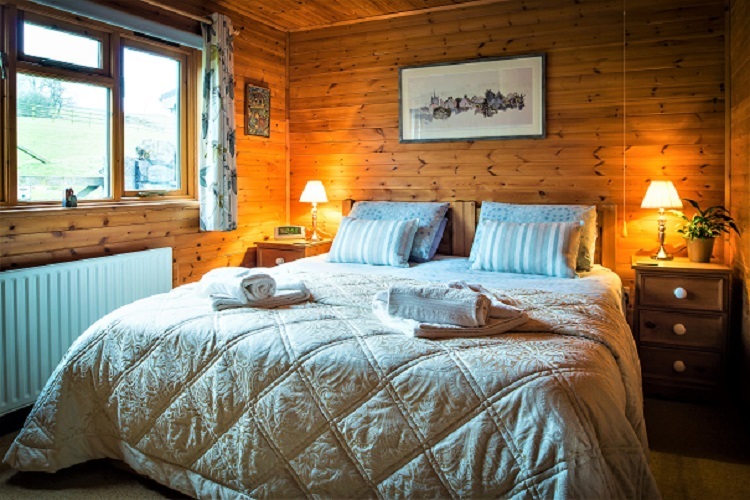 Hoe Grange provides a real “home from home” resulting in a happy, memorable hygge holiday. What better way to have a hygge holiday than to stay in a Scandinavian-inspired log cabin? With our environmentally-friendly ground source heating, you’ll be snug as a bug, even in the depths of winter. 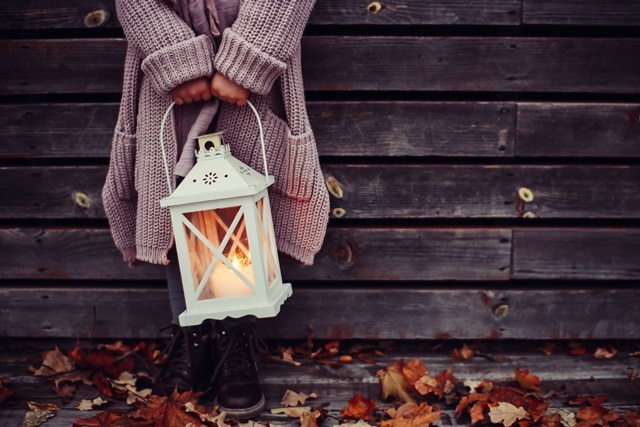 It’s possible to hygge alone, wrapped in a woolen blanket with a cup of tea, but the true expression of hygge is lighting a lantern and joining with loved ones in a relaxed atmosphere. Relax in the steamy water of our log-fired hot tub with a glass of mulled wine, or unwind completely in the steamy barrel sauna. With Hoe Grange nestled so deep in the countryside, you’ll find yourself transfixed by the dark starry skies above. The tranquil peace and quiet is what our guests love the most. Or visit the Stardisc at Wirksworth where all the stars are mapped out for you on the stone circle. Once you’ve explored the stunning Peak District countryside around Hoe Grange, rest your weary feet and sit down to a heartwarming supper of winter stew, with some mulled wine. There’s nothing better than sharing food with friends. 4. 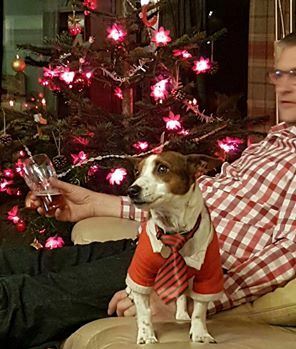 Bring your four legged friends too! We welcome dogs at Hoe Grange – think woolen-socked feet gently resting on a snoring Labrador after a long winter walk – cuddle up and connect with your trusted friend. Twix and Crunchie love a little tummy tickle, whilst Fudge sneaks on to the sofa and is just plain spoilt – so adorable she gets away with murder! 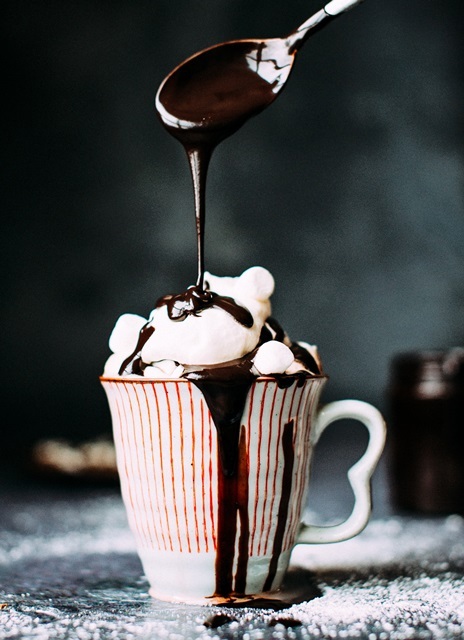 Light some candles and watch the flickering flames whilst you silently sip your hot chocolate – truly scrumptious. 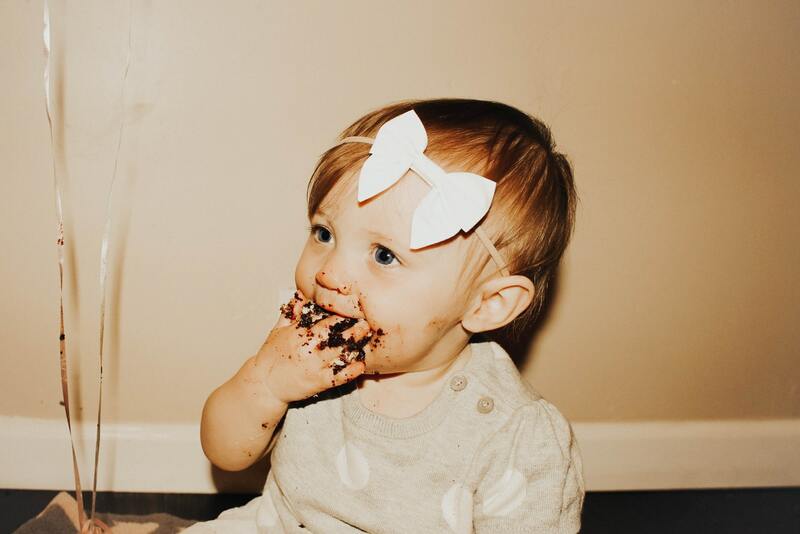 There is nothing quite like the comforting taste of chocolate, and who cares about the calories! The Danes buy the most candles and research shows that creating hygge with candlelight brings happiness, who can argue with that! 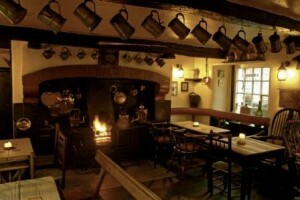 Wrap up warm and walk over the hill to the pub for a pint and toast yourself by the roaring fire. When something is hygge, you say it’s hyggelig (“HOO-gah-lee”). You can definitely have a special hyggelig evening at Ye Old Gate in Brassington. Exercise increases levels of dopamine in your brain (the ‘happy hormone’), so cycling is very hyggelig. Why not borrow one of our mountain bikes? 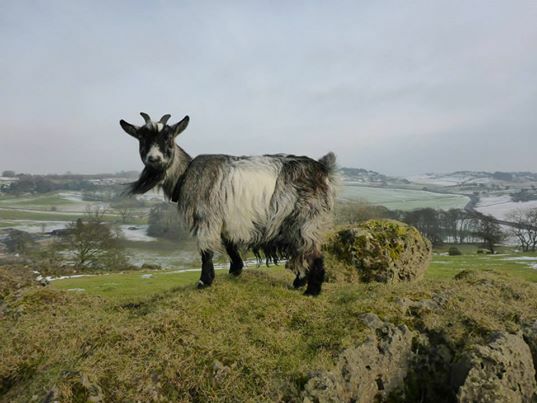 It’s a great way to enjoy some fresh air and explore our Peak District countryside. It would be even more hyggelig if you hire our off-road wheelchair or our vintage tandem for two! 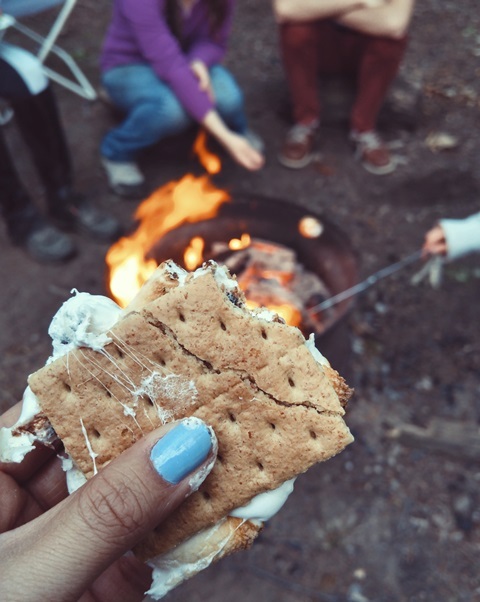 Take time out and relax in the dry heat of our barrel sauna, or wrap up in blankets, sit round the firepit, toast marshmallows and sing together – share your hygge and let the warm, fuzzy feelings flow. Hygge is being aware of a good moment whether it’s simple or special. It’s all about experiences rather than material stuff, and booking a holiday at Hoe Grange is a great hygge way to get through the dark winter months.